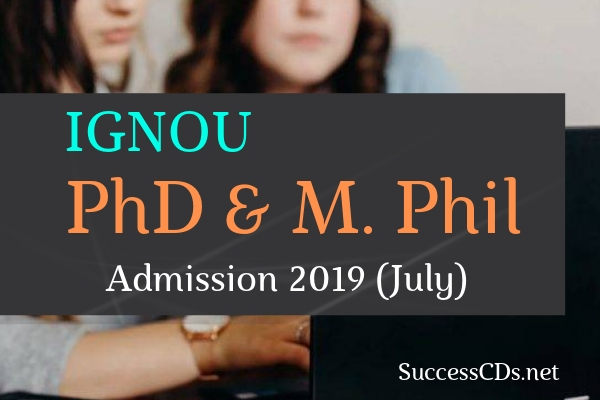 IGNOU PhD and M.Phil Admission 2019 - Applications are accepted by Indira Gandhi National Open University (IGNOU) for PhD/M.Phil Admission twice in a given year i.e. in January and July respectively. Eligible and interested candidates can apply for IGNOU PhD/M.Phil Admission. This university conducts an entrance test that is patterned on UGC and CSIR exam. Candidates holding an M.Phil degree or those with required eligibility and experience are exempted from appearing for the university's entrance test. No Entrance Test shall be conducted in these disciplines. Additional eligibility conditions have been prescribed by individual Disciplines. Candidates are advised to refer these details in the Table given at the end of the Prospectus and ensure that they meet the desired conditions. Note: IGNOU has informed via admission notification that these programs are launched in strict compliance with University Grants Commission (Minimum Standards and Procedure for Award of PhD/MPhil Degrees) Regulations, 2016. Ahmedabad, Bengaluru, Bhopal, Chandigarh, Chennai, Delhi, Guwahati, Hyderabad, Kolkata, Lucknow, Mumbai, Patna, Trivandrum.